The most challenging facet of building a staircase is designing it because of the fact that no two staircases are the same. 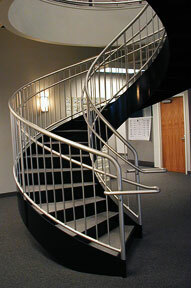 There are numerous variables including stair type, railing style, tread type and individual dimensions such as height, width, and length that make each staircase unique in its own way. Determining all of these variables involves equal parts imagination and engineering. The four most common types of stairs are straight stairs, curved stairs, circular stairs and spiral stairs. 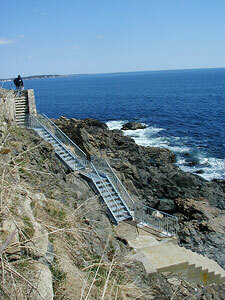 It is also possible to have stairs which are a combination of different types. All of these staircases may present a number of complications such as obscure angles, shapes and inclines; however, no situation is too complicated for our talented craftsmen. In the following pages, you will find a sampling of the many stairs, which have rolled through G&E Steel’s doors over the years. The only common element for all straight stairs is the straight stringers. However, the nature of the stringers does not limit the versatility of this stair type because the stringers can be arranged in numerous positions to make up an infinite number of possibilities. This type of stair possesses several sub-types and is the most common. Approximately 90% of all stairs can be categorized as straight. In plan view, curved stairs have two or more centers of curvature. In plan view, circular stairs have an open circular form with a single center of gravity. A spiral staircase has a closed circular form and possesses a central supporting column.